This is the era of the Internet. 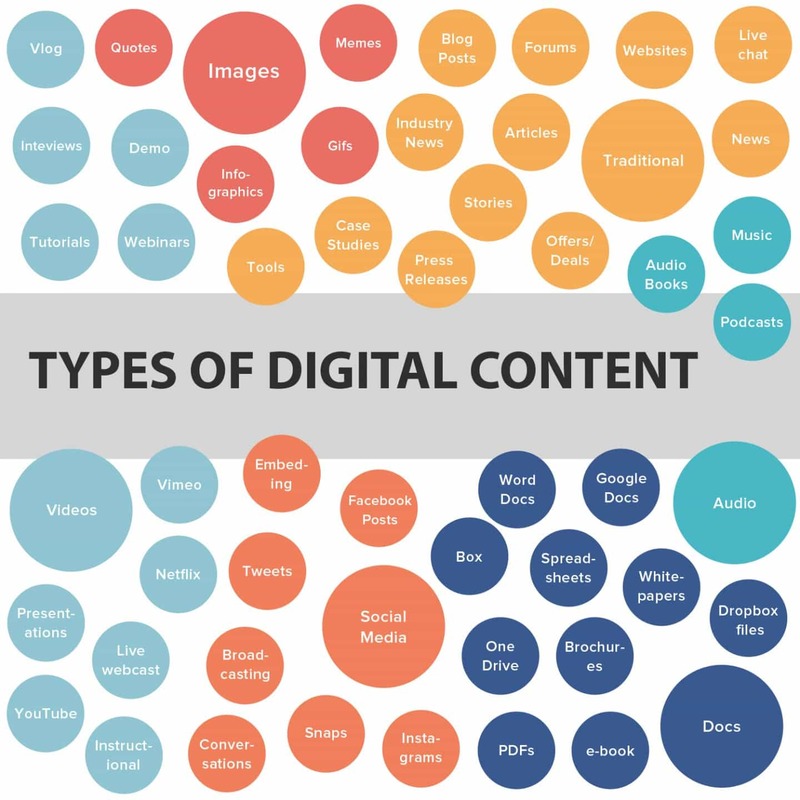 Everything we do has a digitalized angle to it based simply on the CONTENT we read on Google. Our every research (done in the form of queries) on Google leads to a set of webpage results. In present times, it’s all about CONTENT and how you PRESENT it in front of your target audience. Make your content easily searchable while answering your target audience queries in a well-defined manner on your website/blog. Your consistent efforts will help you create a positive online reputation in this tech-savvy world. But, the question arises: how to reach your target audience? How to make your content easily searchable for your target audience? 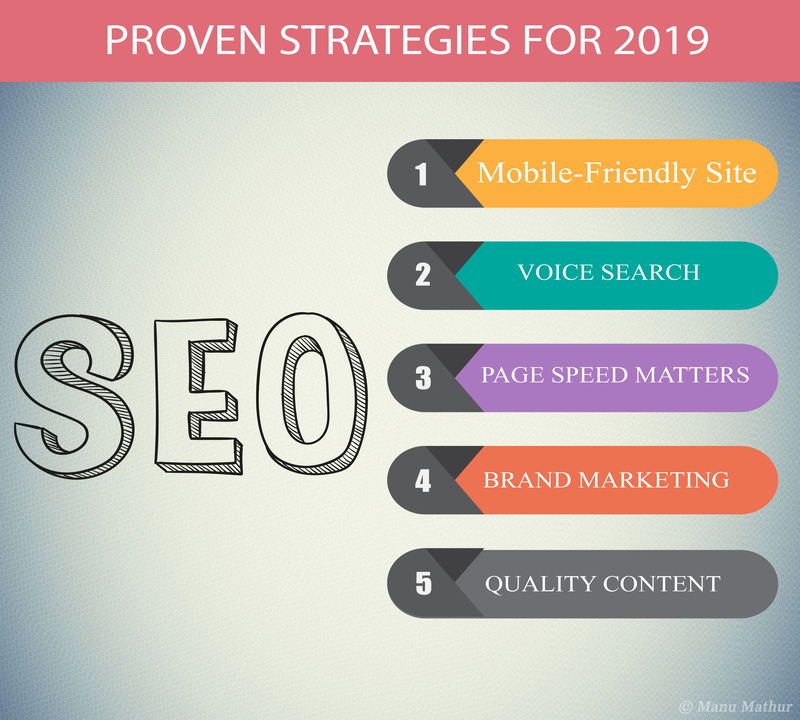 Read this post to learn about Best 5 SEO strategies you must implement on your website/blog in 2019. The right SEO implementation matters as it will keep you ahead of your competitors and will also help you reach out to your target audience quickly and simultaneously boost your traffic. You must know that majorly 80% of user traffic for any website comes simply from search queries, out of which 75% doesn’t even move beyond the first SERP (Search Engine Result Page). Understanding the same fact, it is important that your website ranks on the #1 page amongst Google search results. The best way to achieve the same is by applying the right SEO strategies on your website/blog. 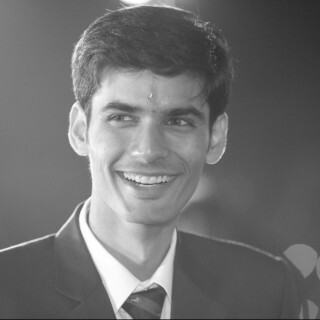 If you are keen on getting a deeper understanding of all the strategies in the right manner, read along the content piece. Last year in March 2018, Google made mobile-friendly websites as its primary criteria for ranking and indexing. It was done primarily due to a significant boost in the mobile industry. With the change in Google policies, users were required to migrate their website to mobile-versions on a priority basis. You must understand that mobile-first index is different from mobile-only. Read the official developers page if you would like to know how are these two terms different. Also, if you have an existing website, and have no idea on how to make it mobile-friendly, check out this amazing guide by Hootsuite on creating a mobile-friendly website. M-dot websites: The first mobile-based websites ever used by the brands as per the user requirements. It failed to exist for a longer duration as users failed to share the m-based links (to desktop clients) due to the bad user experience. Additionally, it was a hassle for the site owners to manage two separate URLs at the same instance of time. Responsive Design: Known for its adaptability, it has been in use for a long time. Even Google prefers responsive websites without biasing on the designs. However, as a site owner, you need to please the audience of both the interfaces and weigh the risks properly to maintain the traction. Adaptive Design: Flexible for site owners allowing them to create a separate interface for mobile-users and desktop-users with zero conflicts. It improves page-load speed considerably, yet is complex and requires a handful of resources for proper implementation. Google Hummingbird update in 2017 took users by surprise and changed the future of search completely. Its ease of accessibility helped users adapt to the upcoming technology and over the years, users became more used to it. Digital assistants like Alexa (by Amazon), Cortana (by Microsoft), and Siri (from Apple) are trendsetters in this domain. In the present scenario, digital assistants are becoming more intelligent and users are getting used to giving voice commands in their everyday routine. The substantial growth in technology is making voice-based search queries simpler every day. Tech giants understand the potential and invest billions in the technology which is a clear indication of its booming potential. So, avoid further delays, and start capitalizing on the users who are already using these tools for web search. You must focus on improving your Page Speed as it is an important factor when it comes to SERP rankings. If your users have to wait for long to get their results, they would bounce back from your site. Ensure that your waiting time shouldn’t be more than 3 seconds (normal website) or 7 seconds (e-commerce website). Slow loading speed kills conversions big time, and as webmaster, you must minimize it. Image Size: Ensure your images aren’t too bulky. Reduce their size using Free/Paid compression plugins like Smush or Short Pixel. Prefer JPEG for photos, while PNG for images that contain no logos. Advertisements are a big NO: Avoid advertisements as users hate too many ads on the website. Other than irritating the incoming users, Ads slow down the page speed. Un-optimized Browsers/Plugins: Test your website across different browsers as each browser follows a different loading technique to load web pages. Widgets: Avoid using too many widgets on your website. They clutter your site layout plus unwanted social-buttons can further impact your page speed. YSlow: It works similar to the other two tools above, and provides you with relevant insights to improve your site performance. You must keep a track of how is your audience engaging with your brand online. There are various monitoring tools online like Awario that can take help you. It tracks your mentions across the web (blogs/news sites/forums). If that is one tool you prefer, sign up for a 14-day Free Trial today. The sole reason Google emphasizes more on Brand Mentions is that your brand is like your identity. Another way to market your brand online is by tending to user complaints or queries. Social media is one platform where users tend to complain about issues or raise questions specific to your brand. Ensure you are helping them resolve their queries and are simultaneously answering all the queries truthfully. Doing so will help you gain the loyalty and trust of your audience with ease helping you with SEO. So, work on creating a positive buzz online as the more people talk about it, the better it gets for you and your brand. Stay ahead of your Competitors: Ensure your content provide more value to your audience using a different perspective; something none of your competitors has ever used. Descriptive Content: Include every information possible on your site. Lack of relevant information can backfire your efforts. So, keep your content descriptive enough. Customer Engagement is Important: Creatives are the best way to engage with your audience. Creatives include colorful images, videos, infographics etc. Keep communicating with your visitors either through Comment Boxes or social-media widgets. Maddie Osman (Renowned author on Search Engine Journal) curated a detailed guide on How to Evaluate SEO Value of a Content to make beginners understand the subtle art of content curation. If your site is SEO-friendly with major technicalities in place but lacks original content, you won’t be able to improve your sites organic search rankings. So, curating quality content is your best bet to enhance your site’s visibility and exposure in the eyes of Google and your target audience. 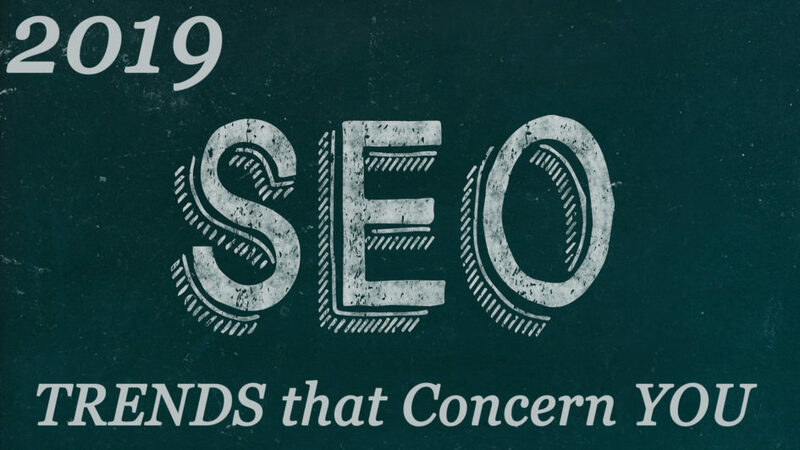 2019 has just begun and a lot of changes in the SEO domain are expected this year. Knowing the trends will keep you one step ahead of your competitors. The process is surely time-consuming, but worth the efforts. Hopefully, these 5 SEO Strategies covered in this post gave you a fair idea on what to expect. So, stop waiting and start experimenting with these trends now! With the right knowledge, it would be easier for you to rank your site higher. If you have any queries or simply want to share your SEO tips with us feel free to comment below.